Howdy my fair and delightful readers! Christmas is right around the corner, or so I’ve been led to believe. Christmas carols are being played on a loop in retail shops. Christmas trees and decorations are everywhere. Heck, there’s tinkle and glitter everywhere you look! This year, I thought I’d get in early and get it quick with my Christmas recipe ideas. I started out with the delicious Chocolate Shortbread Cookies, as I thought they would make delicious treats and really cool gifts! But we also come to the critical part of Christmas. This year, the Boy and I would like to share a simple recipe which we’ve tried out gleefully to our happy bellies. We do hope you enjoy making and eating this as much as we do, and not stress out too much in the kitchen and spoil your loved ones with all things beautiful, kind and delicious! Preheat oven at 250 degrees Celsius. Peel and de-seed pumpkin. Cut them into chunks. Clean and peel the carrots (Well, I guess peeling is optional as some prefer the skin on). Combine 40ml of canola oil, 2 Tbsp of honey, 1 sprig of thyme and 3 cloves of garlic and mix thoroughly. Separate mixture into half. 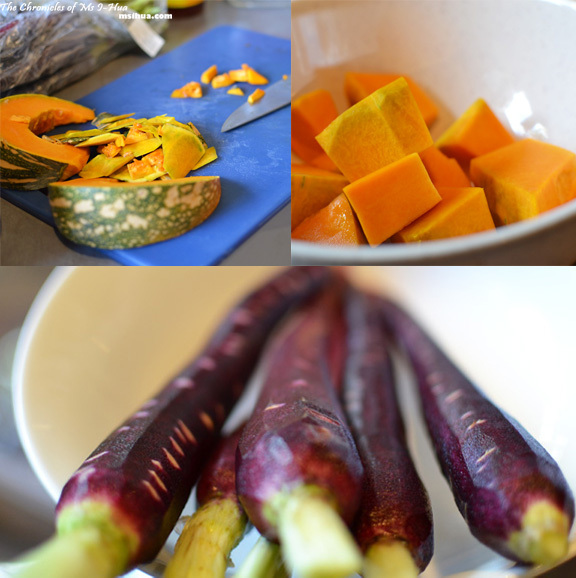 Toss pumpkin chunks with one half of the mixture and purple carrots with the other half. 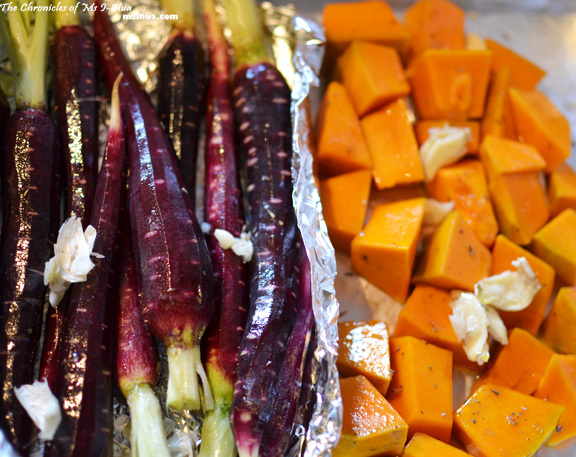 Place marinated pumpkin and purple carrots at the bottom of the roasting pan. We placed the purple carrots on a separate aluminium foil to prevent it from colouring the pumpkins when they start cooking and releasing its juices. Using a paring knife, cut out the wishbone from your chicken to ease carving later. Season the cavity of the chicken with salt and pepper. Add the remaining garlic cloves, middle rasher bacon slices and 5 sprigs of thyme into the cavity. 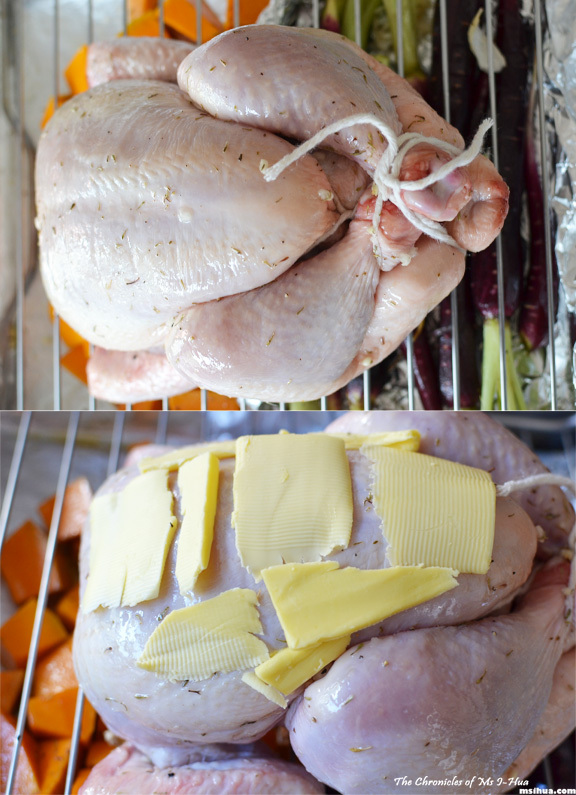 Truss your chicken (there are a few helpful videos on YouTube) with a kitchen twine. Combine the remaining canola oil with the dried thyme leaves. Rub all over chicken. Generously season chicken with salt and pepper. Place chicken on the roasting pan tray (breast side up). 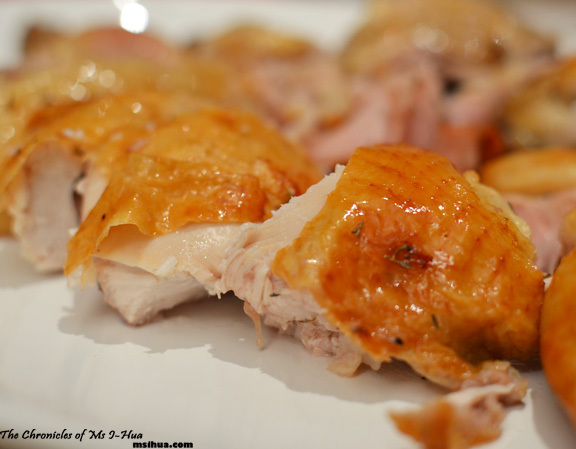 Cut butter into a few thin slices and place all over the chicken breast. 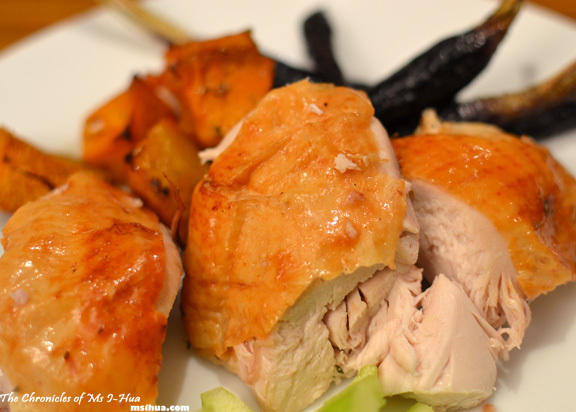 Put roasting pan with chicken and vegetables into the oven for 25 minutes. Reduce the heat to 200 degrees Celsius and roast for another 45 minutes. Check the chicken by skewering it under the breast (where the thigh meets the breast). If the juices that flow out is clear, then your chicken is cooked. 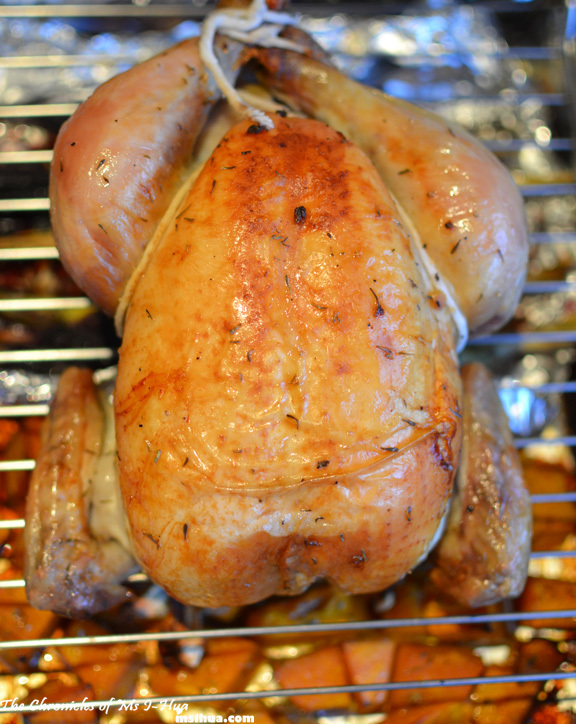 Take roasting pan out and let chicken rest for 15-20 minutes. Remove vegetables and cover them with an aluminium foil to keep warm. Remove kitchen twine and discard contents from the cavity. Carve chicken into desired number of pieces. Just before serving, you can reheat the vegetables on a pan with its juices. Plate both chicken and vegetables and serve. Good tip to put the chicken in the fridge to crisp the skin and I love the purple carrots – they look delicious. We always do the traditional turkey, ham, and then potatoes and sweet potatoes, sometimes with other veggies too. I saw purple carrots for the first time the other day at my local Coles, but they were clearly a bit old and floppy. 🙁 Only bunny ears should be floppy, not bunny food! Michelle chin recently posted…Hong Kong: Loaf On (Luk Fook) Restaurant @ Market St, Sai Kung. Oh wow, I do love a good roast chicken and purple carrots make it all the more colourful for the Christmas season :). Happy holidays! Thanks Ames! Happy Christmas to you toO!!! 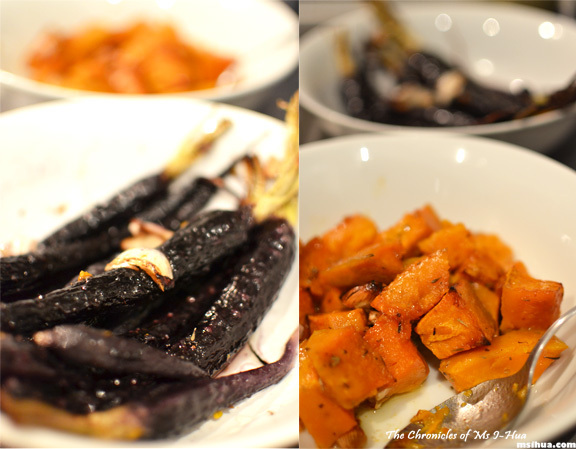 Mmmm crisp buttery skin:) The purple carrots are beautiful! Yup! Anything for crisp buttery skin! Jeeves!! hehe. Purple carrots are such a novelty. I do prefer orange one, taste wise :)Merry Christmas!! Yayy! I <3 Jeeves! Merry Christmas to you too!